Just as at Culbin Sands, the dunes near Findhorn village preserve ample evidence of the use of this ecologically rich area going back millennia. 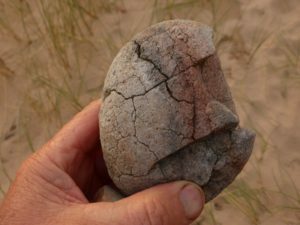 While flints and fire-cracked stones can be found widely scattered among the shingle between the dunes, one site in particular was evidently used by many people over a considerable period of time in the Bronze Age (roughly 2500–1200 BC). The remains of a midden containing shell fish and animal bone suggest at least seasonal hunting and gathering, and a very extensive scatter of fire-cracked stones suggests cooking. 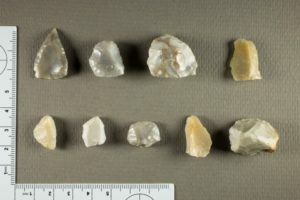 Hundreds of pieces of flint debitage point to took making, including arrow heads, thumb scrapers, and strike a lights. Other finds indicate that this was also used as a burial place, in particular cremations. The evidence ranges from numerous fragments of coarse cinerary urns and decorated beaker fragments; fragments of cremated human bone; fragments of bronze (likely from brooches, awls, etc. ); a number of beads, including stone, glass, and faience. The latter are rare finds in the UK, and have also been found on Culbin Sands, and in a Bronze Age burial uncovered in Findhorn Village in the 1980s. 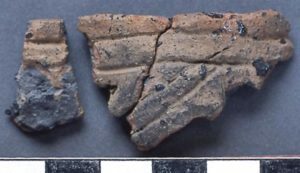 Recent chemical analysis of the faience beads suggests that they were made locally, and are not imports from the Near East as was once thought. The landscape in this area also contains a discontinuous burnt layer, in places buried by sand dunes, and provides a record of how the land surface has changed over the last three thousand years or so. The artefacts and fire-cracked stones all seem to be associated with the burnt layer. The site extends to the coast edge, where it is being actively eroded. It’s impossible to know how much has been lost already, but the loss is steady, and visible from year to year, and so it is important to record this heritage before it is lost.